The Uniformed Services University in Bethesda, Maryland, is the only Federal service academy with the mission of producing military medical officers. The university seeks to produce the next generation of medical leaders for our nation’s military: graduates are more than just doctors and nurses who happen to wear uniforms. In terms of class composition, a minority of the medical students have prior military service, though most students do not have any military training and attend immediately after completing college. The motto of the university is “Good Medicine in Bad Places,” and nowhere is the special quality and mission of this University more evident than in the final exam for its senior medical students and doctoral nursing students, “Operation Bushmaster.” Bushmaster is a week-long simulated combat deployment that confronts students with challenges of leadership, ethics, organization, and medical competence under the physiologic stresses typical to deployment, such as reduced sleep, physical discomfort, exertion, and disrupted diet. The exercise features hundreds of role players, many with realistically moulaged injuries, and is overseen by dozens of experienced military leaders who provide guidance and evaluation. The exercise takes place in the fictional, war-torn nation of Pandakar, and the students must be cognizant of the dynamic political situation in the “country” while maintaining a high degree of sensitivity to the local customs and social norms as they interact with various role players. This exercise is run in two iterations, so immediately after I completed the first iteration of the exercise as Honor Graduate, I returned to Pandakar for the second iteration, accompanying another platoon of my classmates as an embedded photographer. It was my goal to capture the student perspective in this formative moment for many young officers. I was inspired by classic conflict photojournalists such as Eddie Adams and James Nachtwey, and I followed this platoon through the entire exercise with my Leicas and Rolleiflex. Obviously, no real danger exists in this exercise, but it provides a profound crucible to observe personal growth as future physicians and nurses grapple with challenges that for most are completely outside of their experience. With the support of the University, I published a tritone monograph of my images from the exercise, accompanied by essays and poetry from classmates and faculty. 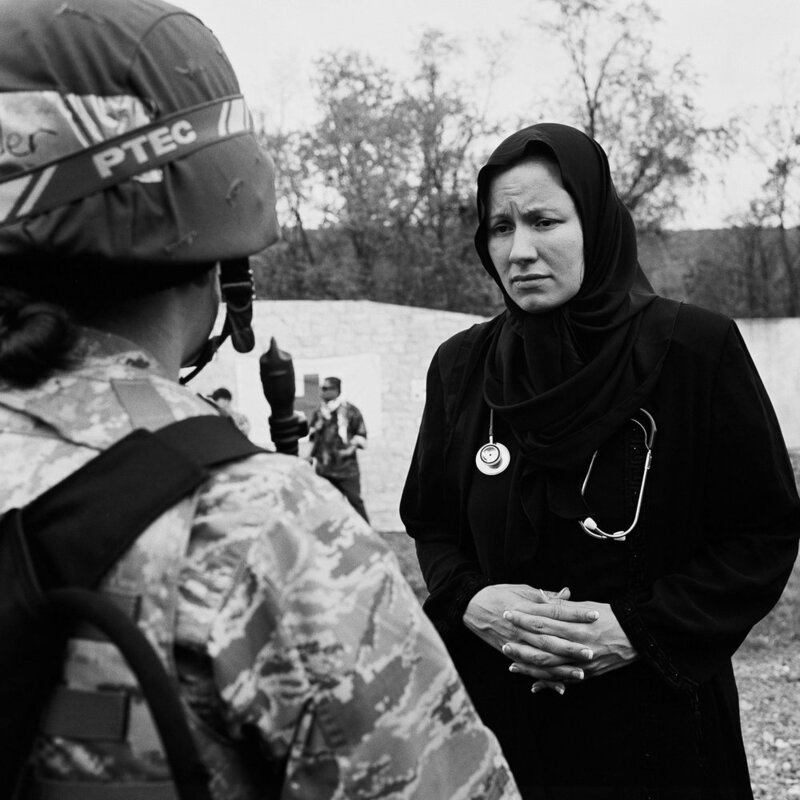 It is my hope that these images provide some insight for viewers into how military doctors and nurses learn to care for those in harm’s way.